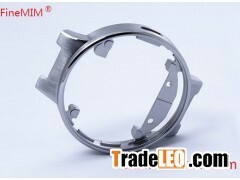 FineMIM offers stainless steel smart watch case using metal Injection Molding process. What is metal Injection Molding? metal Injection Molding (MIM) is a development of the traditional powder metallurgy (PM) and plastic injection molding process. MIM process is an advanced powder processing technique because of net shaping with shape complexity at low processing energy and 100 % material utilization. • Mixing – Blend fine metal powders with proprietary ingredients to create viscous feedstock. • Molding – Form complex shapes using standard injection molding tools and equipment. • Debinding – Prepare molded components for high temperature sintering. • Sintering – Subject components to temperatures up to 1600°C to achieve up to 99% densification. • Finishing – Add standard engineering detail as needed (e.g., plate, heat treat, black oxide). • Industry leader in engineering unique components for production. • Fast development of alloys & new materials. • Rapid and economical prototype development system. • Continuous sintering suited for high volume production. • Flexible processing addresses large and small parts. • Resources available for the largest production requirements. Tips：This page [MIM Parts for Smart Watch Case] infomation provided by [FineMIM Tech Co., Ltd.] ,the enterprise is responsible for the authenticity, accuracy and validity of the information content. www.tradeleo.com do not assume any guarantee of joint and several liability. A safe way to suggest that the two sides trade, to ensure the interests of both sides. Without www.tradeleo.com written permission,Do not copy this site all information works and business information.